What does ICCID stand for? And what does the ICCID # mean on my phone? ICCID stands for Integrated Circuit Card Identifier. ICCID number identifies each SIM internationally. A full ICCID number is 19 to 22 characters. 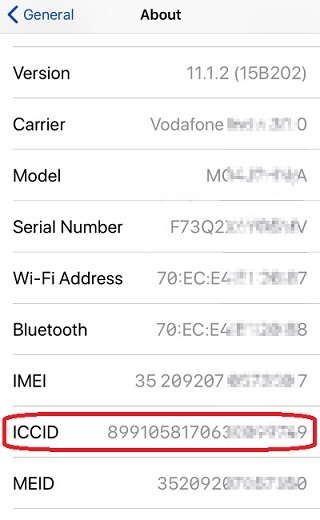 You can find the ICCID # of your phone usually in the "About" areas in "Settings". ICCID can be divided into 3 parts: IIN (Issuer Identifier Number), AIN (Account Identification Number) and Checksum. IIN (Issuer Identifier Number) - The IIN part can be further divided into 3 sub-parts: MII (Major Industry Identifier), International Calling Code, and Issuer Identifier. The MII is a fixed value of 89 controlled by the ISO 7812 standard for "Telecommunications administrations and private operating agencies"). The International Calling Code is 1- to 3-digit long controlled by the ITU-T E.118 standard. For example, 1 = North America, 01 = United states, 61 = Australia, 86 = China, 354 = Iceland, etc. Issuer Identifier is 1- to 4-digit long controlled by the ITU-T E.118 standard. For example, AAPT = 14, EZI-PhoneCard = 88, Hutchison = 06, Optus = 02/12/21/23, Telstra = 01, Telstra Business = 00/61/62, Vodafone = 03, etc. 4 digits to represent Month and Year (in MMYY format) when the SIM card (which carries the ICCID) was manufactured. 2 digits to represent the switch configuration code. 6 digits to represent the account number of the service subscriber. Checksum - The Checksum is a 1-digit long calculated from all other digits in the ICCID using the Luhn algorithm. The next two digits 91 refers to the country code of India. The next two digits 10 refers to the issuer of Airtel. The next four digits 1200 refers to December of 2000, when the carrying SIM was manufactured. The next two digits 00 refers to the switch configuration code. The next six digits 320451 refers to the account number of the subscriber. The next one digit 4 refers to the checksum. On a iPhone, you can find the ICCID by going to the "Settings > General > About" screen.